The culprit in hijacking case of PIA Flight 544 Shahsawar Baloch and Sabir Baloch has been executed by hanging on Thursday at Hyderabad Central Jail. The terrorists had hijacked a PIA passenger flight 544 on May 24, 1998 with 33 passengers and 5 crew members on board in order to stop testing of nuclear weapons Pakistan developed. 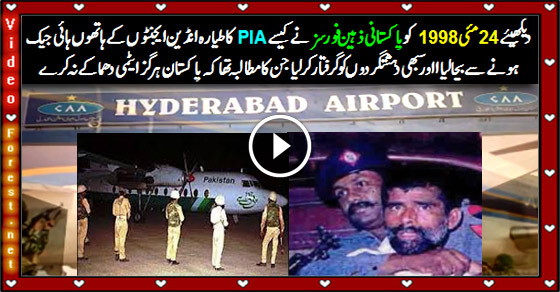 The flight took off from Gwadar International Airport and was scheduled to land at Hyderabad airport. The terrorists forced the pilot to take the flight to New Delhi. The pilots told the hijackers that the flight, Fokker F27 model, did not have enough fuel to make it to New Delhi to which the hijackers demanded to land the flight at nearest airport in India. The pilot then contacted Hyderabad airport and addressed it as Bhuj airport. Comprehending the signal, Hyderabad airport staff pretended to be from Bhuj airport and told the pilot Bhuj was waiting for the plane to land. This was a sort of assurance for the hijackers. Upon landing, Rangers’ Major Aamir Hashmi, SSP Akhtar Gorchani, and Deputy Commissioner Suhail Akbar Shah waited outside the aircraft while dressed as Indian personnel which led the hijackers to believe they had landed in India. Acting as Indian airport staff, communicating in Hindi and introducing themselves to the hijackers with Indian names, Pakistani officials successfully convinced the hijackers to let women and children go. The final show down happened when the commandos’ reinforcement stormed the aircraft chanting “Allahu Akbar” (God is great) slogan which left the hijackers shot. One of the hijackers fired at Deputy Commissioner but missed and shot one of his own accomplices instead. Subsequently the hijackers were arrested and transferred to Karachi for prosecution. The anti-terrorism court awarded them death penalty and despite issuance of death warrants only to be canceled owing to temporary moratorium on death penalty. However, the fresh death warrants have been issued and their execution is scheduled for May 28, the date on which Pakistan successfully test fired nuclear weapons in 1998. The final meeting of death-row inmates with the families took place on Wednesday at the Central Jail.